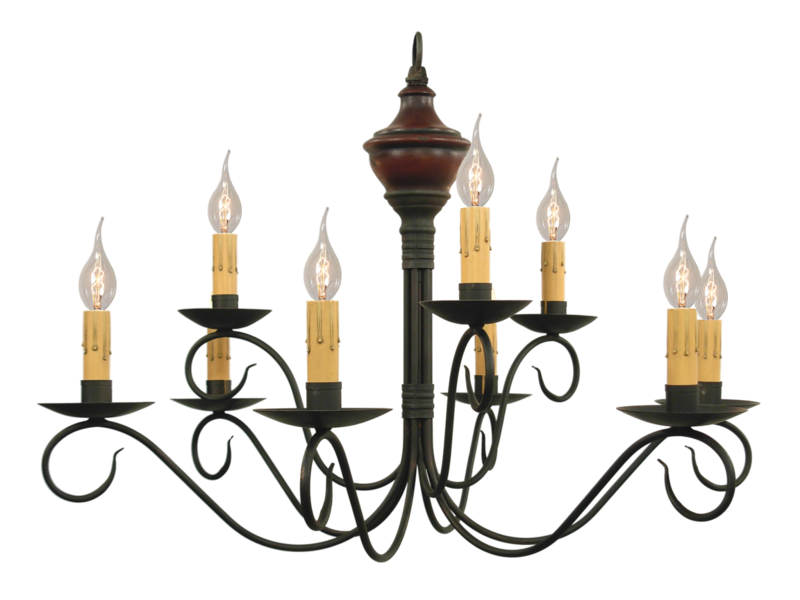 Primitive and country décor enthusiasts have a handful of mainstream primitive style lighting manufacturers to choose from, along with hundreds of sole proprietor shops. There are 3 companies that produce a very high percentage of the primitive lighting available in America today. These three have a number of things in common as well as some striking differences. Before shopping for primitive lighting taking these things into consideration may be beneficial. What is known as Irvin’s Country Tinware today began around 1960 when a 16 year old craftsman named Irvin Hoover fashioned his first lantern from an old stove pipe. Since then his business has evolved to serve retailers in the United States and Canada. They are located in Mount Pleasant Mills, Pennsylvania, contact them to find a dealer near you. Irvin’s is a handcrafter, they are not a fully automated production facility, and therefore you can expect superior quality fixtures, with subtle variations in finish. Unlike other manufacturers Irvin’s tends to produce lighting in advance and warehouse it, this allows them to ship quicker than other handcrafters who produce the fixtures as the orders come in. Irvin’s "Made In The USA" product line is UL Listed and comes with a Limited 5 Year Warranty. UL listing is becoming more and more important to building inspectors, with some area’s not permitting fixtures to be installed without it. Many of their fixtures are wired for and rated at 60 watts incandescent per socket. Irvin's also offers an imported product line in which some of their products are UL Listed and some are not, read product description for details. Formerly known as Katie’s Light House, Katie's has been producing colonial reproduction lighting since 1983 when Katie was hammering out tin lanterns in her garage. At one time Katie's employed over 20 people in their Cridersville, Ohio shop, shipping lights through the United States and Canada. Katie’s is a colonial lighting handcrafter, they are not a fully automated production facility, and therefore you can expect superior quality fixtures, with subtle variations in finish. Unlike Irvin’s, they custom produce fixtures as the orders come in, which means customers can expect to wait 3-15 business days for their order. Katie's chandeliers are UL Listed for both the United States & Canada. Katie’s lights are covered by a 5 Year Warranty. Many of their fixtures are wired for and rated at 60 watts incandescent per socket. Unfortunately Lt. Moses was recently sold and their retail shop, Cobblestone Cottage in historic St. Charles, Missouri, is now the exclusive source for Lt. Moses Willard. Lt. Moses Willard is the oldest of the big three primitive lighting companies. More than 200 years ago Lt. Moses Willard gave up the life of a soldier and became a master tinsmith. While the company as evolved since then it still remains true to vision of natural simplicity and handcrafted excellence. They ship their lighting products throughout the United States and Canada. Lt. Moses is a handcrafter, they are not a fully automated production facility, and therefore you can expect superior quality fixtures, with subtle variations in finish. They custom build fixtures as the orders come in and customers should anticipate a 4-8 week wait until their order arrives. Their products are both C & UL Listed and come with a Limited Warranty. Many of their fixtures are wired for and rated at 60 watts incandescent per socket. 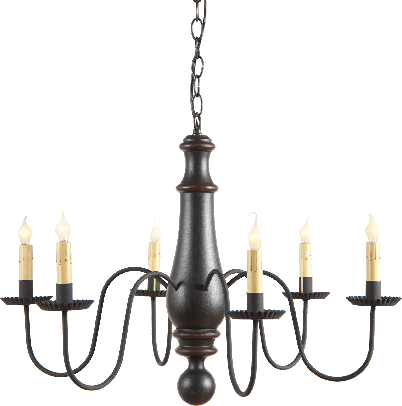 Gainesville chandelier pictured at right in Salem Brick Red over Black with Dark Rittenhouse Green Trim. Lt. Moses has a vast color palette available for customers to choose from. Beyond that if you are trying to match something else in your home, give them a paint manufacturer and color, they will be glad to accommodate you. If you are looking for a custom color combination or the most authentic colonial style lighting LT Moses is the line for you.